Seriously, don’t trust science reporting! I came across an especially annoying example of bad science reporting today, and I want to make an example of it. The article in question comes from the always-trustworthy site I F*cking Love Science, and the headline reads: If We Don’t Cut Our Carbon Emissions, This Is What The World Will Look Like By 2100. Paints a pretty scary picture, right? 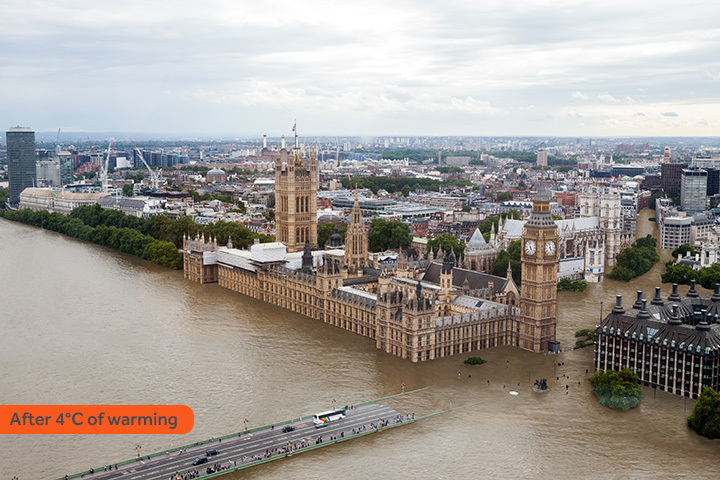 I mean, heck, look at London – it’s practically half-underwater. And this is only for 85 years in the future! Clearly dire action is needed to save the world’s cities. The only problem is, it’s not true. In fact, the article makes a very basic science error, and the pictures do not depict what the world will look like in 2100. At all. I’m going to explain what the error was, but as an exercise in critical reading I encourage you all to try to figure it out for yourself first. The scientific papers that the pictures are based on are all linked in the article, and the error in question is not a particularly subtle one. Give it a try! Okay, did you get it? 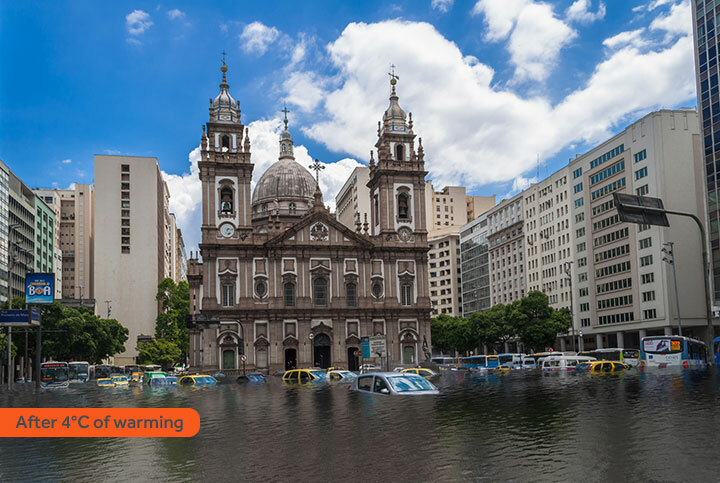 The error is: the pictures depict the amount of sea level rise expected due to a certain amount of warming by 2100, but they do not depict the amount of sea level rise by 2100. The ocean is pretty big . It has an enormous heat capacity, and it takes a long time for it to respond to changes in the climate. If you increase the surface temperature of the earth then the sea level will eventually rise to reach a new equilibrium value. But the key word there is eventually. The time scale for the ocean to reach equilibrium with a new surface temperature is on the order of ~2000 years. The study that inspired the above photos looked at short-term increases in temperature – in particular it looked at two cases, 2°C or 4°C warming by 2100. But the sea level increases that are quoted are not for 2100 – they’re the long-term equilibrium values, which will not be reached for several millennia. In other words: yes, the pictures do accurately depict what the effects of 4°C of warming will be…in the year 4100. 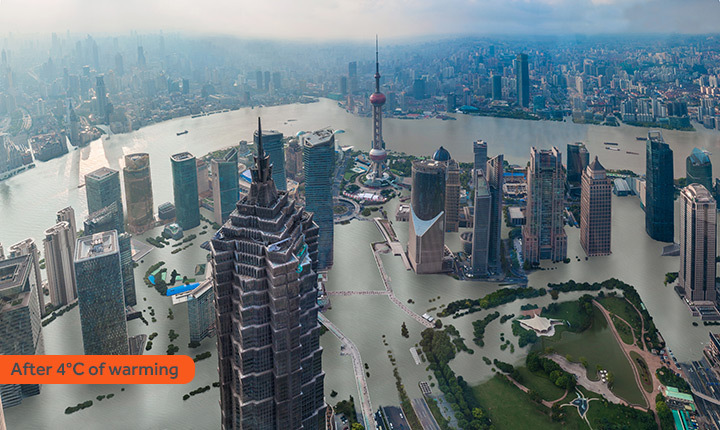 In actual fact, the projected sea level increases for the year 2100 are more like 1 meter – which is not even close to what the pictures show. This means the article was wrong. It was not a little bit right, it did not stretch the truth or make an ambiguous error. It was just straightforwardly wrong. Well, I feel like it’s safe to say that most of the people reading this will have already heard the advice, “Don’t trust science reporting.” Heck, it’s become almost a cliche at this point – there’s been an xkcd and multiple SMBC’s on the topic, which is a good indication that something has permeated the collective consciousness of the nerdy internet. But I also think it’s safe to say that people are not nearly paranoid enough in this regard. People pay lip service to the idea that science reporting is bad, but they don’t take it to heart. I originally saw this article linked to on a forum I frequent, and in the responses not one person questioned the validity of what the article was saying. Everyone just accepted it without question. It’s worth asking yourself whether you would have done the same, if I hadn’t primed you to be skeptical of it. Seriously, I don’t know how to emphasize this enough: don’t trust scientific reporting. Period. Don’t trust it in general, but especially don’t trust it when the topic that’s being reported on is political. And super-duper-especially don’t trust it when the topic is political, and the conclusion of the article supports the ideological bent of the source in question. And needless to say, super-duper-extra-especially don’t trust scientific reporting when the topic is political, the conclusions support the ideological bent of the source in question, and the conclusions support your own ideological bent. That’s just a recipe for disaster.